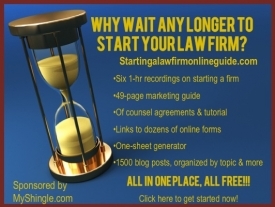 When I started this blog, to read the mainstream legal media, you’d have thought that solos were the only lawyers to ever miss deadlines, violate ethics rules or commit malpractice. But I’ve always believed that all lawyers, from those at ginormous firms to those who practice alone, are all equally prone to making mistakes and committing malpractice. And my hunch is borne out by this article that I blogged about over at Legal Blogwatch that discusses the types of malpractice acts committed by large and small firm attorneys. The good news? Missed deadlines, once a common basis for malpractice claims against solos, are no longer as much of a problem with the advent of cheap computerized calendar systems. Now, most solos face claims for lack of competence in areas beyond their expertise. But as I wrote in my other post, I expect that with blogging and social networking, competence claims will be reduced as well, either because lawyers will educate themselves on other practice areas through blogs, or build relationships with lawyers in different practice areas with whom they can affiliate on a case without losing the client. For biglaw, I’m not as hopeful. Increased rates means that clients are more demanding about results; they don’t want Chevy service at Ferrari rates. And multiple mergers can give rise to conflicts, and rather than letting a client leave, firms will either ignore conflicts or try to find ways to keep clients with diverse interests – which can lead to malpractice actions if a case goes south. Of course, big firm malpractice isn’t something about which we solos should gloat. Increased malpractice actions means higher premiums for all of us, regardless of size.